Squalene Market size is forecast to exceed 5,300 tons by 2022, with over 9% CAGR from 2015 to 2022. This global squalene market report expects industry revenue to exceed USD 240 million. Strong cosmetics demand, particularly in Germany, France, UK and Italy is likely to drive squalene market size. Germany dominated the Europe personal care & cosmetics market size with over 14 billion in 2014, while France, UK and Italy were valued around USD 12 billion, USD 11.8 billion and USD 10.6 billion respectively in the same year. Revenue growth is most likely to come from primary applications such as anti-ageing & moisturizing creams and emollients. Anti-inflammatory & anti-oxidation characteristics are widely desired in lotions, creams, ointments and lipsticks. Squalene demand was historically mostly met from shark liver oil, which contains it in maximum amount at 30% in comparison to other vegetable sources. Excessive shark killing for liver oil has drawn attention of various regulatory agencies and environment groups, to limit deep water fishing. This had seen global consumption shrink by more than 60% over the last decade. Deepwater sharks are most vulnerable to overexploitation owing to low reproduction potential, this has already caused decline of some species such as the Portuguese shark, which is rich in liver oil content. In 2008, cosmetic industry giants such as Unilever and L’Oreal had announced to replace shark liver oils with plant derived oils. Since 2006, EU has imposed limitations on deep sea shark fishing and also has secured certain ban on directed fisheries through CCAMLR and North East Atlantic Fisheries Organization. This has restricted shark pouching to certain extent and has also caused squalene market price trend fluctuation along with supply imbalance. Vegetable sources such as olive oil, amaranth oil, rice bran oil and wheat germ oil have also experienced tight supply in recent years, with demand from competing applications and low crop yields. Additionally, extraction from olive oil is not particularly attractive in terms of cost. Amyris, a biotechnology company, has developed metabolic yeast route for low cost farnesene production, which is an essential building block for numerous chemicals, including squalene. The company started focusing on this industry only in 2012, via its first commercial farnesene facility in Brazil, however, synthetic squalene from Amyris already accounts for over 10% of global supply. Vegetable sources have dominated squalene market share and are forecast to generate revenues well above USD 130 million by 2022. Olive oil is found to be the richest vegetable source for production and contains approximately 400 mg per 100 gram. Vegetable sources may see sizable gains, owing to limitations on deep water shark fishing and scaling issues for Amyris. Shark squalene industry demand was pegged over 900 tons in 2014 with likely to witness lowest gains during forecast period. Shark liver oil is preferred by suppliers as they are inexpensive and contain in higher amounts in comparison to vegetable sources. Cosmetics applications generally monopolize industry demand, with USD 65 million revenues in 2014. Key product uses include bath oils, hair preparations, eye makeup, sun tan preparations, nail products, body powders, and cleansing, moisturizing and skin care preparations, with content ranging from 0.1% to 50%. Dietary supplements may grow at over8.5% CAGR up to 2022 and exceed 1.1 kilo tons. Increasing consumer awareness for maintaining healthy lifestyle and avoid expensive medication should most likely boost demand for dietary supplement application. Europe squalene market size, with major demand generated from cosmetic industries based in Germany, France and UK, was the predominant regional industry, with forecast of over USD 110 million revenue generation by 2022. Increasing natural ingredients demand, especially plant derived, for personal care & cosmetic products by consumers owing to harmful effects from fossil fuel sources is most likely to fuel growth in Europe. North America, dominated by U.S squalene market size, was estimated to consume over 600 tons in 2014. Dietary supplement applications are likely to significantly grow among the U.S. consumer base, thereby triggering demand. APAC, led by China and India squalene market share, is likely to grow at significant pace over the next six years. Latin America, supported by strong growth indicators in Brazil, is relatively at a nascent stage with respect to consumption. 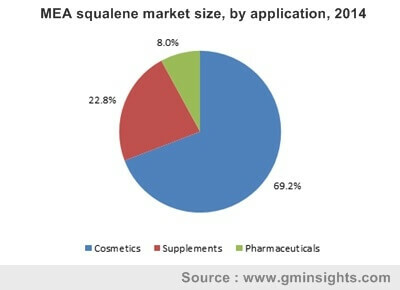 Global squalene market share is quite consolidated. Major manufacturers are focused on product development and obtaining high purity products for niche segments such as pharmaceuticals and dietary supplements. Amyris, Arista, Croda, and Nuelis are notable manufacturers. Other prominent companies include Arbee Fish Oil, Sophim, Gracefruit, Kishimoto Special Liver Oil Co., Coastal Fisheries, SeaDragon, Empresa Figueirense de Pesca Lda, Carbomer and Aasha Biochem.